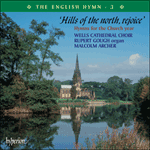 The story goes that this hymn was inspired by the view from a hill-top near the author’s native city of Bath. It became a hymn of thanksgiving for all God’s blessings, in the natural world and in human relationships, but moving on to his gifts in the Church. As here, those verses are usually curtailed to bring the hymn back to its first themes. It is good to be able to sing of such things, though one must be sensitive that not everyone’s experience of family life is a happy one. The tune expresses this quiet joy. It was written by David Evans, a widely influential Welsh musician, and given the Latin name that means ‘Lantern of the Lothians’, probably referring to the remains of a monastery at Haddington, East Lothian, Scotland, destroyed in 1355, or to the fifteenth-century church on the same site.